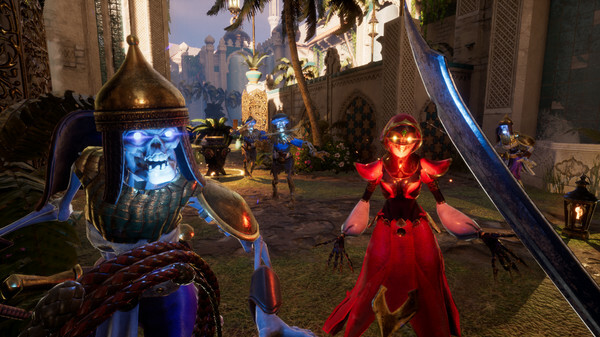 If I had to describe City of Brass to a skeptical bystander, I’d begin by telling them to stop censoriously waving their finger, and just listen. I mean, even the Sultan listened to Scheherezade, and he was viciously impatient. City of Brass bows in reverence to Arabian Nights, transfiguring its words and illustrations into scorchingly delicious hack and slash action. Unlike the Prince of Persia games it throws serious nods at, everything in City of Brass happens from a first person perspective, right down to the melee combat that switches into fluid freestyle movement. You’ll be armed with a shiny scimitar and a multi-purpose bullwhip that should come in handy when slitting the throats of overzealous undead hordes, but the opulent metropolis within your midst is alao stacked with climbable walls to vault past, and a hazardous mix of deadly pits, arrow storms and poison gas traps delivered in true procedurally generated form. City of Brass is being developed by former BioShock team members and slides into its release date on May 4. It’ll be available on PC, PlayStation 4 and Xbox One.